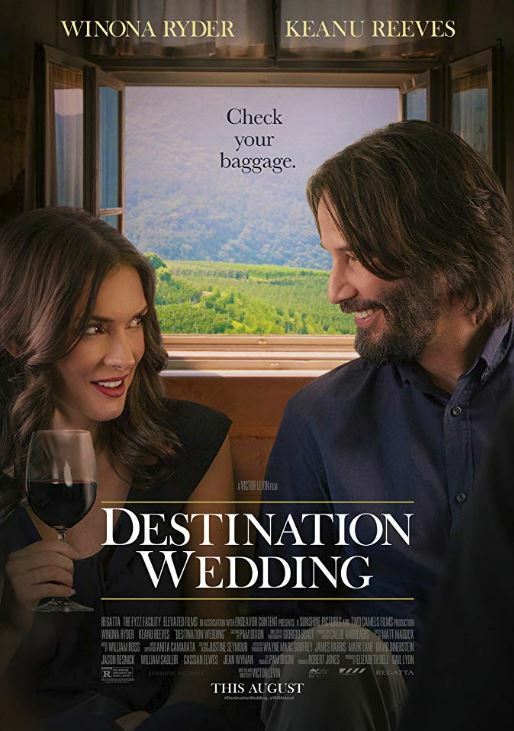 'Deckard' is charmed by DESTINATION WEDDING (starring Keanu & Winona)! Deckard here with a review of DESTINATION WEDDING a romantic comedy by long-time television writer and second time feature film director Victor Levin (MAD ABOUT YOU) starring Keanu Reeves and Winona Ryder, two stars we have long histories with and whom share history (let us be glad their English accents from BRAM STOKER’S DRACULA stayed in the past). This film has all the makings of a tossed-off fly by night V.O.D. comedy, just slick and cheap enough to get produced, but I’ll be damned if I didn’t find something much more interesting here, and what’s more, and perhaps rarer, DESTINATION WEDDING is a romantic comedy that actually works. The interesting thing here is that Levin has given us almost completely a two-hander. I’m not sure if anyone has more than one line in this other than the two leads, hell, I’m not sure anyone else had a line at all, and this is a motor-mouthed talkie that could easily be a play. On top of that almost every shot in the film is static, further eliminating distraction from the performances of the actors and the quality of the dialogue as we follow two strangers living in Southern California who are on the same flight to the same weekend long wedding in Central California, are given adjoining rooms, seated next to each other at rehearsal dinner, etc. Winona and Keanu play modern, sophisticated, screwed up people, she the groom’s ex-fiance, he the groom’s brother. Of course, they hate each other from go and of course you know how they’ll feel when the story ends, but with the style in which Levin has conceived this film it ends up feeling more like Neil Labute doing Howard Hawks than a 1990’s attempt to do a screw-ball comedy. Which is a tough thing to pull-off and it isn’t all gravy. The opening scenes are almost painful and make one dread the rest of the film, but it slowly wins you over, less with the romance than with the comedy and some of its observations. 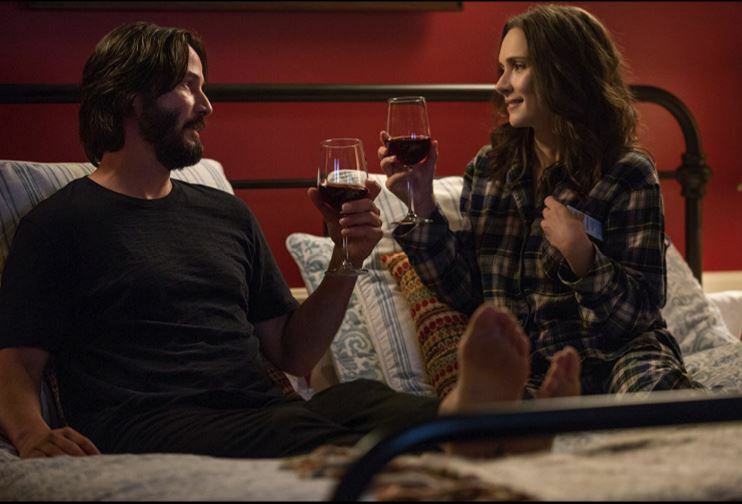 In the film, Winona and Keanu have lots of theories on relationships as they do everything under the sun, and some of them are quite inspired. if Winona and especially Keanu wouldn’t be your first choices for a motor-mouthed talkie, well, their performances aren’t perfect here, but as the film goes along, you realize that the roles have so much silliness and dialogue to them that playing them perfectly would have been a Herculean task, and that Winona and yes Keanu are actually both quite good in the film. I liken it to Michael Fassbender in STEVE JOBS, is he the greatest thing I’ve ever seen in it, no, but he’s been given so much rope to hang himself with all that dialogue that I was marveling at how few missteps there are. So, with the performances here. They don’t overplay, and they say their lines rapidly. Both performers are to be commended. I’m sure Levin is grateful. Not only does he have them soliloquize frequently, but he also just gives them tons of banter, sometimes to a ridiculous degree which Levin uses as the joke in the picture’s standout set-piece. This sequence involves the pair wandering away from a wine tasting, stumbling upon a mountain lion (thank you Mr. Hawks), and the aftermath of said mountain lion encounter. Levin brings all of his aesthetic choices to bear here from the overtalking, to the static shots, to the way neither character is ever seen even remotely undressed in the entire picture. I would feel bad spoiling the jokes, but it gave me a lot of laughs, and I was with DESTINATION WEDDING for the rest of its run-time. A few quibbles. Keanu plays a thrifty guy here, and two of Levin’s choices just show how out of touch he is with today’s cheap bachelor. One: Keanu rocks an old-school suitcase, likely to denote him refusing to buy a new one. In reality, he would have to pay extra on every flight to check that monster. Hey, Keanu, I bought a 15 dollar modern, over-head compartment friendly suitcase in Chinatown ten years ago, and I’m still rocking it today. At another point he waits for a taxi. C’mon, man, Uber is way cheaper. Also Levin uses jokey intertitles that feel like nails on a chalkboard. Those two things and the slight unevenness of the picture aside, I really recommend it. I would call it a perfect date movie. 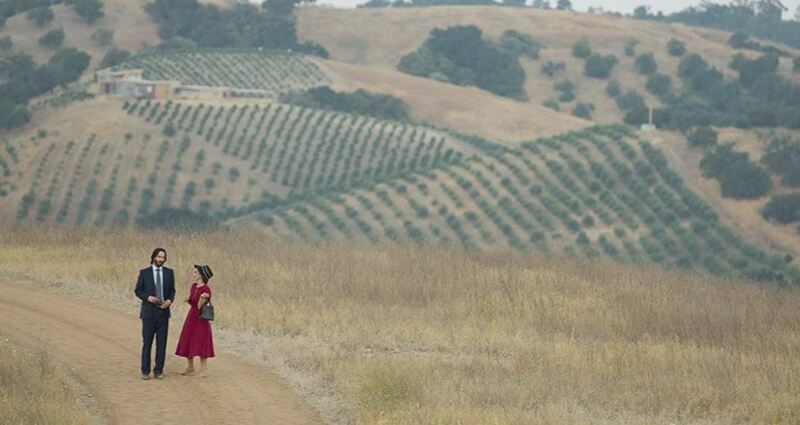 You laugh and you root for the romance to endure. I wish I’d been watching it with a lady, and if one ever stoops so low as to interact with me, I’ll try to lure her into watching this actually. It even comes complete with a point to stop paying attention and make out. What more could you ask for? DESTINATION WEDDING is available now on all VOD platforms.